The Love’s truck stop construction site on Thursday, Dec. 7. Interstate 5 is in the background. 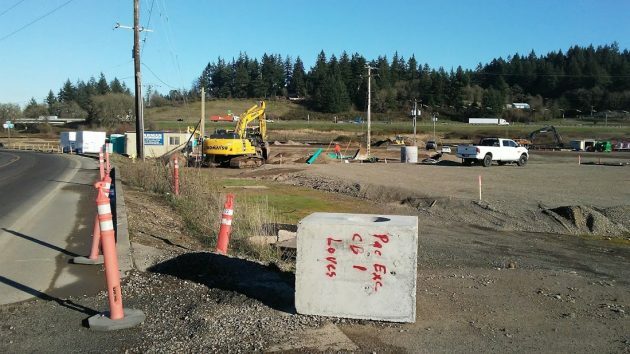 Building the planned Love’s Travel Center in Millersburg is taking longer than anticipated. That’s the word I got when I checked with City Hall this week after taking a look at the site on Old Salem Road. Industrial buildings have been demolished, obviously, and excavation work is going on at the site just west of the I-5 interchange with Jefferson Highway. Mayor Jim Lepin happened to be at Millersburg City Hall when I called there on Friday. As he understood it, Love’s had run into groundwater issues at the site and was dealing with them. He said the company had originally hoped to open the Millersburg travel center in February. But that evidently is no longer possible. One of the conditions imposed on the project by the Oregon Department of Transportation was that Love’s build highway improvements at the northbound ramps of Interstate 5 on the Jefferson Highway. I hadn’t seen any sign of that, and Lepin said those changes indeed had not been started. Love’s won final approval for the truck stop in February from the Millersburg City Council and ODOT. The company’s plans for the 12-acre site call for a store, a fast-food restaurant as well as fuel islands and plenty of parking for long-haul trucks as well as passenger vehicles.